The world has plunged into a period of brutality, with impunity for the perpetrators of violence. Syria is suffering untold civilian casualties as a divided United Nations Security Council sits on the sidelines. 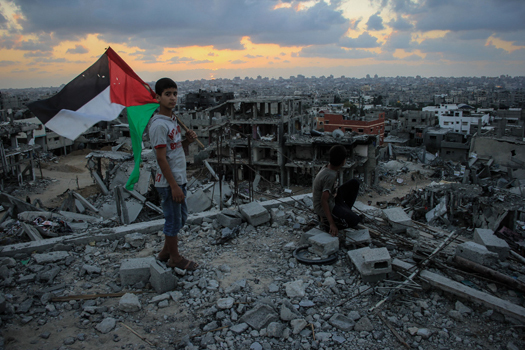 Gaza was pummeled to dust yet again with the world watching on. Iraq is in flames, with no end in sight. Atrocities are mounting in South Sudan and the Central African Republic, which are also being swept by an epidemic of sexual violence. Even Europe is not immune: a civilian aircraft was shot down over a conflict zone in eastern Ukraine, and officials were prevented from investigating. Twenty-five years after the fall of the Berlin Wall, and more than a decade after the establishment of the International Criminal Court (ICC), shockingly little is being done to stop these abuses, and the prospects of the victims ever getting justice, let alone bringing the perpetrators to account, seem ever more remote. For many years, the world seemed to be progressing toward greater recognition of human rights and demands for justice. As democracies emerged in Latin America and Central and Eastern Europe in the 1980s and 1990s, these issues assumed increasing importance. Although wars, conflicts, and atrocities continued, the global powers tried, and occasionally managed – albeit chaotically and usually late – to stop the killing. Moreover, the international community created frameworks for justice to deal with the consequences of violence, a move that was scarcely imaginable during the Cold War. New UN-backed international and hybrid tribunals were created to bring to account perpetrators of atrocities in the Balkans, Rwanda, Sierra Leone, and Cambodia. The ICC, with jurisdiction over atrocities committed in 122 member states, was established to try cases referred to it by state parties or the Security Council (even though three permanent members – the United States, Russia, and China – have not ratified or acceded to the Rome Statute, which places parties under ICC jurisdiction). In addition, many governments, with UN support, created mechanisms for transitional justice at home, including more than 40 “truth commissions” (such as in Argentina, El Salvador, East Timor, Morocco, and South Africa), reparation programs, and prosecutions. None of these efforts has been perfect, but they have given victims a voice and recognized their suffering, while signaling to culprits that their crimes will not be forgotten. Such measures have also deeply affected, and in some cases transformed, public discourse for the better. Today, however, the international community appears to be backsliding on its human-rights commitments. The world’s emerging powers lack any sense of urgency in addressing abuses, preferring the pursuit of narrower, short-term interests to investing in long-term peace and justice. Without robust support from the international community, the institutions of justice are coming under pressure – and losing their momentum. Several countries have attacked the ICC; African Union members want heads of state to be immune from prosecution, thus undermining a fundamental principle of the court. To be sure, many states undergoing political transition are doggedly pursuing some form of justice. For example, justice and human rights are at the heart of the historic peace talks in Colombia. Despite the collapse of the Arab Spring, Tunisia is pressing ahead with reforms, including the creation of a Truth and Dignity Commission. But these societies may find it difficult to address adequately their troubled pasts without the support of international institutions. Elsewhere, the fight for human rights might become virtually impossible. Indeed, it will be hard enough to defend the human-rights gains made since the end of the Cold War, much less to expand them. Fortunately, governments’ growing reticence about progress on human rights – if not outright obstruction – will not stop civil-society groups from continuing their fight for justice. Groups like is Argentina’s Mothers of Plaza de Mayo and the Mothers of Srebrenica have always bravely led the way; they will, no doubt, continue to do so. But the absence from this process of key governments, especially the emerging powers, threatens to end the world’s all-too-brief era of accountability. It is time for the international community to redouble its resolve, regain its sense of purpose, and reaffirm, in both word and deed, its commitment to human rights and a more just world.